Being in the European Union has given Scotland the power to opt-out of GM. Scotland has used devolved competencies to opt for enhanced environmental protection, including through agricultural subsidies and Marine Protected Areas. Any centralisation or watering down of powers from the Scottish Government to Westminster be it on agricultural subsidies, the regulation of fisheries, food safety, or the application of environmental law, is deeply undemocratic and at odds with Scotland’s strategic priorities and plans. The lack of detail on Brexit negotiations and the prospective Great Repeal Bill makes it difficult to say what our legal and political landscape will look like in the next few years – but Scotland must not, without the consent of the Scottish Parliament, lose any powers in this period. Scotland’s food sector is sustained by migrant workers. Any sudden restrictions on current access and entitlements would be potentially catastrophic to Scotland’s economic prosperity and food security. Migrant workers from across Europe make up 6% of the UK’s workforce. However, the proportion are approximately 11% of workers in food services, 27% of workers in food manufacturing, and up to 95% of seasonable agricultural workers. Moreover, as a matter of equality and respect, migrant workers must continue to have equal protection in pay, working conditions, and rights to challenge employers that break the rules. The main cause of household food insecurity, currently near 21% in Scotland, is that incomes are too low. Not having enough money to buy food is also a significant contributor to poor dietary health – with huge social costs: a recent Scottish Parliament Information Centre report found the costs to the NHS in Scotland of obesity alone were up to £600mn annually, and the total economic cost as much as £4.6bn annually. With minimum wage setting powers the Scottish Government could set the lowest wage tier at the real living wage – ensuring incomes meet the cost of living. Overnight this would raise about a fifth of people in Scotland out of relative poverty, mostly women and people working in the food sector, whilst also making a significant impact on child poverty and the attainment gap. The Scottish Government is in the process of taking over the administration of a number of entitlements, totalling around 15% of the overall spend in Scotland, and including most disability benefits, welfare foods – like the Healthy Start scheme, and the power to top-up all social security entitlements. The Scottish Government has committed to a rights-based approach to social security, putting dignity and respect at the heart of the new system. Whilst some operational arrangements have been put in place to prevent punitive sanctioning from the DWP on work-related entitlements, people in Scotland will continue to be negatively impacted by the roll out of University Credit – with many still unable to afford a basic standard of living, including access to food. The devolution of remaining reserved powers would enable the Scottish Government to develop and deliver a comprehensive and fair social security system. The European Union, Brexit, us, our food… where next? On Thursday 23rd June, 52% of British citizens spoke against continued EU membership. Nourish Scotland had spoken out in favour of Britain remaining in the EU, and we are deeply worried about the consequences of a Brexit, in particular to our food system. The stakes of the EU Referendum were tremendous: 43 years as a Member State of the European Union have had a deep impact on our political, economic, environmental, cultural, and social landscape. Migration, red tape, subsidies and trade matters dominated much of the debates, but EU membership is about much more than that. The future of our food system is at stake. What does the EU have to do with our food? So much. The most direct and obvious way in which our EU membership affects our food system is through the Common Agricultural Policy (CAP) and the Common Fisheries Policy (CFP). 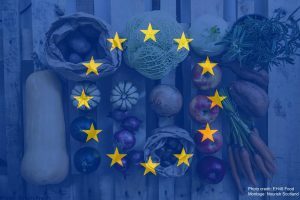 But it goes beyond these two policies: social and environmental regulation, international trade, research, waste and circular economy, free movement of people,… In this short blog we present the multiple stakes of the EU referendum for people, environment and economy with regards to our food system. 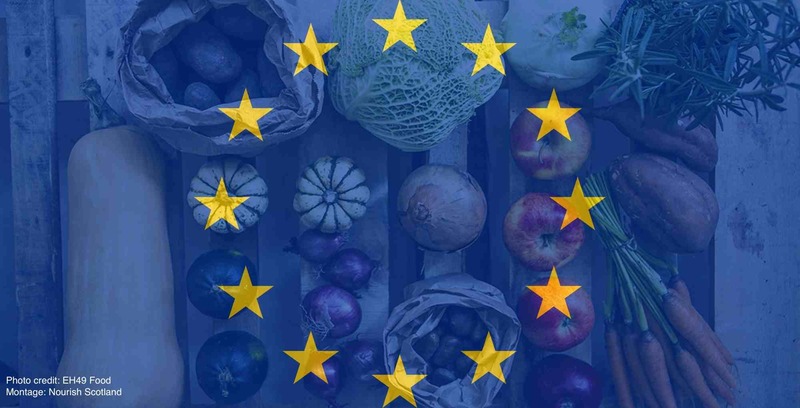 If you would like to go deeper in your understanding of the present impact and future stakes of EU membership, read this excellent report by Tim Lang & Victoria Schoen for the Food Research Collaboration: Food, the UK and the EU: Brexit or Bremain?. In the run up to June 23rd, Nourish published a series of posts explaining the main food-related reasons why we thought the UK should vote for Bremain. Those #TastierIn posts can be read below. We also organised an evening workshop about building the case for ‘Bremain’ on May 25th. A summary of the discussions, including the list of speakers, can found here. In the wake of the Brexit vote, these issues are still extremely relevant, as we will need to put pressure on the government to make the rights decisions for the future of food and farming in Britain outside the EU. Nature gives us food, air, water and many more things necessary to life, wellbeing and our economy. The EU is committed to protect Europe’s natural capital and rich biodiversity. We believe that neither the UK or Scottish governments would have gone as far as the EU to protect nature, nor would we have been so integrated into the cross-Europe collaborative approach that is required to protect wildlife across the region. All EU countries are working to a European Biodiversity plan. Leave Europe and protection of our valuable biodiversity will almost certainly be eroded and compromised. Second up in our #TastierIN series: the Common Agricultural Policy (CAP). We argue that a Brexit from the EU and the CAP would leave our farming sector worse off, on both economic and environmental counts. The CAP is one of the only purely European policies – i.e. decided by European Member States at EU-level and paid for almost entirely by money from the EU budget. Brexit would mean the end of the CAP for our farmers and it is very unclear what would come in its place in Scotland and the rest of the UK. A Brexit-induced end to the CAP could mean an economic disaster for many farmers. UK farmers receive yearly up to £3 billion in CAP subsidies. While we wouldn’t go as far as saying that all of this money is well spent, a lot of it does help keep our farmers afloat in these difficult times for the farming sector. Furthermore, through its Rural Development Pillar the CAP gives targeted support to specific groups or sub-sectors who particularly need it. For example, in Scotland these are new entrants, sheep farmers, and crofters to name a few. Another economic benefit of EU membership is the free access to the EU market for all our food and agricultural products. This is not negligible: over half of all British food and farming exports, amounting to more than £11bn a year, go to our fellow EU countries. The environmental case is less obvious but not less real. Although most environmentalists are strong critics of the CAP for its negative impacts on the environment, the CAP does contain important elements that have contributed to mitigating – and sometimes actively improving – the environmental footprint of our farms. First, all farmers receiving CAP subsidies through the Basic Payment Scheme (a.k.a. Pillar 1, this amounts for 70% of CAP money) must comply with “cross-compliance” rules. These, also known as “Good Agricultural and Environmental Condition” (GAEC), set basic rules of good practice that aim to prevent soil erosion, pollution of ground water and rivers, and such. Cross-compliance is also an example of the much criticised ‘Brussels red-tape’, but surely farmers should be bound to respect basic good environmental and land management rules to receive public money. Second, 1/3 of Basic Payments are now bound to farmers’ compliance with three key measures that aim to improve soil quality and on-farm wildlife, the so-called CAP Greening. These measures are very minimal, yet this marks the start of a more environmentally-aware farming policy at EU-level. Finally, the Rural Development Programme in Pillar 2 of the CAP offers financial support to farmers who want to improve their stewardship of the land and of their farms’ natural environment. These targeted payments are called agri-environmental schemes. They have proven to make a real difference in helping farmers pro-actively address climate change, biodiversity decline, soil erosion, etc. on their farm. On both counts, economic and environmental, we do not pretend that the CAP is perfect, but that it is better than the most likely alternative in case of Brexit: austerity and de-regulation. In addition, a movement for CAP reform is taking shape and gathering momentum in Europe – both in civil society, academia, and within some EU governments – auguring well for the prospects of a better CAP post-2020… or even a radically different Sustainable Food and Farming Policy. Our countryside, farmers, and the food in our plates will be much better off if we join forces with the movement for CAP reform in the EU than if we leave altogether. Nourish is part of the civil society movement campaigning for CAP Reform! See our Citizens’ Agricultural Policy page for more information and to sign up to updates. We will soon be launching a report “A Citizen’s CAP” which present our views on how to reform the CAP to make it more democratic and more sustainable. Our security and prosperity depend on a successful response to climate change, the most urgent challenge of our time. So does any prospect of a transition to a way of living together that is just and sustainable. And if we fail on climate, we lose the very capacity to shape our destiny that makes sovereignty worth having. So why is climate so relevant to food? Many are surprised to find out that the food industry, including agriculture and food processing, make up 33% of carbon emissions. The way we grow, process, transport and waste food has a deeply significant impact upon our climate. So how does Europe help us to mitigate against climate change? The European Union has long been committed to international efforts to tackle climate change and felt the duty to set an example through robust policy-making at home. At European level a comprehensive package of policy measures to reduce greenhouse gas emissions has been initiated through the European Climate Change Programme (ECCP). Each of the EU Member States has also put in place its own domestic actions that build on the ECCP measures or complement them. The EU is pursuing its climate targets through a combination of financial support and regulation. For example At least 20% of the EU’s budget for 2014 to 2020 – as much as €180 billion – will be spent on protecting the climate. This is on top of funding from individual EU countries. At the global climate change conference in Copenhagen in 2009, there was a stalemate in agreeing targets, but European nations had already committed to collective EU targets and they were therefore able to have the collective strength to stick to them. Europe’s example strengthened the hand of those in Asia, Africa and the Americas who wanted their own countries to do more. European diplomacy helped to forge the global coalition that in Paris last year finally forced ajar the door to a meaningful global climate change target, and European social movements have mobilised across borders to keep their governments on track! The UK was at the forefront of these efforts. Far from undermining our sovereignty, our membership of the EU made it possible to secure our national interest. Just when we need a redoubling of effort, Brexit would gravely weaken Europe’s capacity to act on climate. And its consequences in the UK would be calamitous. Brexit would leave the field clear for those who disagree with intervening in the economy for the public good, preferring to leave the doors wide open to private corporations rather than governments stepping in to build an energy system that is clean, sustainable and efficient, and driven by the needs of households and communities. They are likely also to demand the repeal of the Climate Change Act, the dismantling of the Department of Energy and Climate Change, a new dash for gas with even more fracking than is currently in prospect, and the removal of any remaining measures to encourage renewables, energy efficiency and community energy. The record of the leading Brexiters, in whose image a post-referendum government would be shaped, offers no reassurance that they would resist any of this. In terms of food waste, The European Commission is taking the issue of tackling food waste very seriously. Reducing food waste has enormous potential for reducing the resources we use to produce the food we eat and this efficiency will have a significant impact on helping to minimize climate change. Food waste prevention is an integral part of the Commission’s new Circular Economy Package to stimulate Europe’s transition towards a circular economy and includes related legislative proposals on waste including a revised proposed directive on waste. The EU and Member States are committed to meeting the Sustainable Development Goals (SDG), adopted in September 2015, including a target to halve per capita food waste at the retail and consumer level by 2030, and reduce food losses along the food production and supply chains. So #TastierIn 3 calls for us to stay in the EU to keep our hand in pushing for better climate regulation and to work with our EU partners to make this happen. Pull out, and we will lose our global voice. We will be consigned to the hidden wings of the international climate change stage. In the EU, consumer protection legislation, such as the Charter of Fundamental Rights, guarantees that everyone has the right to be treated fairly, for example when buying food, to buy products which meet acceptable standards and a right of redress if something goes wrong. EU legislation in other areas also has to take consumer protection into account. Generally, consumer protection is ensured by a diverse set of policies, such as food and product safety, data protection and marketing legislation. This protection also extends into aspects for food of sustainability, health and the environment. An example is the recent 18 month ban on the use of Glyphosate that the EU issued, following WHO acknowledgement that this widely used agricultural herbicide is “possibly carcinogenic”. The ban has had a bumpy ride along the way, with disagreement between member states, but is now in place, for 18 months, to allow for further research. As food consumers, Glyphosate is worrying as it finds its way into our food; it has been shown that as much as 30% of bread we buy contains glyphosate. The UK Government was one of the Member States that pushed to continue to license this herbicide, so without the EU and the collective action of all member states we wouldn’t be protected by the ban. We know organic systems work for nature and people; some countries have recognised this and made active decisions to support organic food and farming, and it is encouraging to see the Scottish Government supporting an organic action plan (Organic Ambitions 2016-2020). Denmark is a world leading organic nation with the highest global market share for organic food and an ambitious target to double the size of Danish land that is farmed organically to 15% by 2020. The Danish appetite for organic food has not happened by chance. The government recognises the huge market role that cities and towns play in increasing sustainable food production, and consequently have invested in initiatives that encourage and support Danish consumers, retailers and large public catering services to buy more organic food. The Danish Government has put increasing public procurement of organic food firmly at the forefront of its new Organic Action Plan. Sweden, France and The Netherlands are just some of the other European countries that have set national organic public procurement targets as a key policy driver for increasing sustainable food production and demanding and delivering environmental, economic and social objectives. The Scandinavian cities of Copenhagen and Malmö have gone a step further, using ambitious organic food procurement targets to help meet city-wide sustainable development and social justice goals for fairer, greener and healthier living. Around 90% of the food served in Copenhagen’s public kitchens is organic. Increasing organic consumption is a key action to support the city’s ambition to become the world’s first carbon neutral capital by 2025.
should be grounded in food sovereignty principles and that short supply chains, local and seasonal produce and especially organic production are necessary to achieve food safety and healthy diets. France is aiming to become a leader in agroecology and recognises that this depends on mainstreaming public policies towards this goal. Time will tell how effective this law is in embedding agroecology as the dominant agricultural model, but at the very least it is a bold statement of a desired new direction. So Plenty summarises what other EU countries are doing to lead the way. So why is this all relevant for Scotland, UK and EU membership? Nourish believes we need to establish agroecology and organic farming as the underlying principle of farming in Scotland, and to set ourselves targets for procurement of organic food. One our recent Scottish Parliament 6 election asks was to have 20% local and organic food in our public kitchens by 2020 and we will be pushing to achieve this target. If we remain in the EU we can champion a reform of the Common Agricultural Policy that supports and develops truly sustainable production, directing money to where it delivers most for Scottish citizens in terms of our environment and the food we eat. Arc2020 and Friends of the Earth have reported on the best ways to reform and use CAP for agroecology. We can also continue to be integrated into the EU approach, for example by taking part in EIP-AGRI, which funds research and sharing good practice about sustainability in farming and agro-forestry. If we leave the EU we will be out of the loop – we won’t have the shared momentum and leadership of our EU neighbours and will become more deeply left behind. At Nourish we have decided to follow the lead of other EU Referendum campaigners by suspending our daily messages about the referendum, in order to be part of the time of reflection after the tragic death of Jo Cox. #TastierIn will restart next week. Have a peaceful weekend, from all of us at Nourish. We have been slaughtered into a role of being consumers who each one, on their own, make rational choices; rather than allowing us to be citizens who come together as groups to decide what kind of food we want, what we want our children to have, what we want for our environment, etc. Stakeholders is a term that comes from the corporate meeting room. While stakeholders are defined by their interests, actors are people or groups who have rights. We are not only consumers and stakeholders; but rather citizens and actors with the right to choose what our future food system should look like. So at its core, food democracy is about citizens being able to participate in policy-making and having their food-related rights properly upheld. For us at Nourish it is clear that Brexit would hinder progress towards better food democracy. And this is where Brexit would be extremely problematic. Because our food system is so interconnected with our European neighbours, we would still be impacted by EU laws and rules. But we wouldn’t be at the negotiation table anymore; no one to represent us, no one to hold to account. Of course, we could still improve food democracy at local and national level – this in itself is already a lot of work. But the European level would be out of our reach, and because the UK does not have the political clout that the EU has, the global level would also pretty much become out of our reach. In the EU, we can work to improve political participation from the local to the European level, then work through the EU to improve global governance mechanisms. Rights protection also has a multi-layered structure. Rights that are protected at national level only, like the UK government wants it to be with an independent British Bill of Rights – are fine, but for two caveats: it means that those rights are not necessarily protected as strongly whenever we are outside Britain, and it means that the rights are vulnerable to the continued good will of the government. So, what rights are we talking about exactly? Consumers’ rights, workers’ rights, right to food… the first topic was covered in TastierIn 4, the second will be in TastierIn 8, and the last in TastierIn 10. In all cases, it is clear that EU membership is positive for European citizens’ rights and that Brexit is likely to mean lowered protection of many of our acquired rights. In terms of representative democracy, the EU is as democratic as it could be. The two institutions that make all decisions relevant to the UK are made up of elected politicians (we’re not talking of the European Central Bank because it is not relevant to the Brexit question). In the Council the 28 Ministers of the relevant policy matter represent the governments of the 28 Member States. In the European Parliament 751 MEPs represent the EU citizens who elected them directly; British citizens have 73 MEPs, 6 of which are Scottish. The Commission can be pushy in bringing forward its proposals, but ultimately the decisions are always made by elected politicians in the Council in conjunction with the European Parliament. So the claim that we are ruled by Brussels bureaucrats is just not true. The real democratic issue of the EU lies with public participation, scrutiny, and accountability, which are crucial requisites of the more demanding definition of democracy to which we at Nourish adhere (as opposed to the simple ‘representative’ definition). While these three criteria are problematic in most European states including the UK (as shown by the low electoral turn-out and general disengagement of the public with politics), it is clear that they are particularly problematic with regards to the EU. EU officials are aware of this, and the Commission has made significant efforts to be more open and transparent. However, ultimately the blame lies with ourselves, our media and our politicians. Ourselves, because our interest in, and willingness to engage with, EU politics and policies are – for too many people – inexistent. Our media and politicians, because their failure to faithfully – if at all – communicate ‘EU stuff’ to the general public contributes to our lack of interest and to widespread misconceptions about the EU. The EU cannot become more democratic on its own. Transparency is no good if no one is paying attention to how decisions are made. Accountability doesn’t happen on its own, it needs to be enforced by us. It is up to us, citizens, journalists, local and national politicians to participate, scrutinise and hold our representatives to account. The case has been made time and again in all the previous TastierIn issues: we are in a better position to tackle most current challenges within the EU than on our own. The main argument so far was that the EU provides a unique platform for countries to work together to address common problems. Our governments are not the only ones who can work together though; so can we citizens, activists, farmers, artists, or civil society organisations. Working across fronteers can be difficult for individuals or small organisations, but sometimes it is the best way to achieve stated aims. In the case of the food system, the case should be obvious. We eat Spanish tomatoes, Danish pork, and Canadian wheat. We export our rapeseed oil to Germany, our whiskey to Asia, and our lamb to France (among others). Our food system is not Scottish, not European, it is global. Reforming our food system starts with the local level all the way up to the global. The European level is crucial and inevitable. That is especially true while our agricultural policy is determined at EU-level; but even if Britain voted to leave the EU and we consequently got rid of the Common Agricultural Policy, our food system would still be closely and intricately linked to what goes on in Europe. If we are serious about changing the food system, there is no way we can avoid having to deal with the EU; and we are best placed to do so in the EU, with allies throughout the continent. The first good news is that well-established movements are working for social and environmental justice in many EU Member States. In some countries, those movements are even much stronger than we are in the UK. The second good news is that the EU provides an awful lot of funding for cross-European cooperative projects by civil society organisations, towns, or research bodies. We would lose out so much if the UK isolated itself from the most progressive group of nations and people on this planet. The right to food is better protected within the EU. Whilst the legal protection for the right to food stems directly from UN treaties, not EU legislation, the right to food does receive indirect protection from the EU in a number of important ways. EU law has had a positive impact across most pillars of the right to food. We’ve mentioned the protections to our natural environment and health such as through the control of pesticide use already, so we’ll focus here on financial accessibility of food. Guaranteed worker protections including for paid annual leave, the prohibition of workplace discrimination, and rights for part-time and agency workers. Monitored the adequacy of wages and social security measures against the basic cost of living – highlighting when incomes are too low for an adequate standard of living, as they are in the UK. These protections are particularly important for people working within food the food production, processing, retail and catering environments who are more likely to have insecure work conditions and low pay. There basic securities underpin our ability to access food with dignity and choice. We know that one of the main drivers of food insecurity in the UK has been austerity – manifested as stagnant wages and social security reform. The Chancellor of the Exchequer, George Osborne has made it clear that a vote for Brexit is a vote for £15bn more austerity. Correspondingly, the International Monetary Fund warned of Brexit triggering another UK recession. and it could mean that the social security and services would be further cut and wages more unlikely to rise. In addition, there could be a significant rollback on basic work protections further undermining the security of work. Last week, during the UN examination of the UK’s performance of socio-economic right obligations, the Chair of the UN Committee asked the UK to think strongly about voting to leave the EU if a vote for leave would be a vote for more austerity – reminding the UK that ‘this Committee is allergic to austerity’. The EU could absolutely do much more to protect and progress socio-economic rights, including the right to food. The UK is unlikely to progress these rights outside of the EU, and has made commitments to reform the existing human rights framework – in the context in which these commitments have been made we have every reason to believe that this will amount to a regression on existing protections. Brexit – risks and opportunities for food policy and regulation, a blog published by the FRC, written by Sue Davies, Chief Policy Adviser at Which? Arc2020 have a series of excellent blog posts about Brexit in relation to food and farming. What has Europe ever done for us? : Nourish magazine on EU farming and fisheries policies. The Wee BLEU Book: Scottish MEPs Alyn Smith and Ian Hudghton present the facts and stats about the stakes of EU membership for Scots.